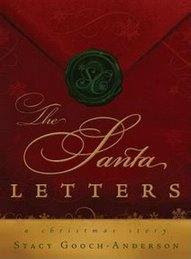 The Santa Letters by Stacy Gooch-Anderson is a perfect read for this time of year. Emma Jensen and her four kids are approaching Christmas without William. William, Emma's husband, was killed by a hit-and-run driver the year before. While she tries to be brave for her children, Emma misses him greatly and is having a hard time with the approaching holiday. Then, a mysterious letter and package arrive on their doorstep. It is signed from Santa Claus and each package has a letter with a message. The letters contain a message that expounds on important themes, such as family, forgiveness, and service. McKenna, the youngest daughter has faith that their father will be there for Christmas. With her faith, the Jensen family embraces the Santa letters with hope and enthusiasm. Each letter and package brings the family closer together and toward a path that will heal their hearts and leads them to forgiveness. I enjoyed the messages that centered around the teachings of Jesus Christ. Forgiveness and service are major themes in the book and leave the reader with a greater desire to focus Christmas on His life and teachings. I saw some reviews on this book a few months ago and added it to my TBR pile (which is way too huge right now, haha! ).